The weather was great for fans of gnarly conditions. The first day's forecast called for 100% chance of precipitation and winds of 20 to 30 knots gusting to 45. That turned out to be accurate. There was even some hail. Gordon Brown, at home in typical Scottish weather. That didn't keep the classes off the water, however. 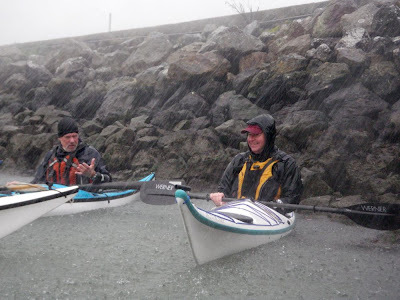 But considering the winds, the especially strong currents and the waves of 18 to 20 feet, nobody ventured out of the San Francisco Bay and several of the classes stayed in the harbor all day, tucking in beside the walls during the strongest gusts. 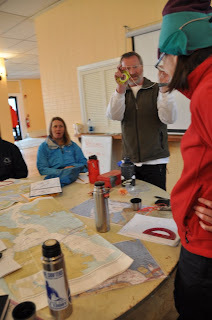 Only the participants in the navigation class stayed indoors--offering a better definition of a dry class. Rob Avery demonstrates a tactical navigation technique. Toward the end of the afternoon, the low-pressure system causing all that wind and rain moved on and the sun came out. That evening, we ventured down to Point Bonita with the home team (Bonnie Perry, Kelly Blades and Mark Pecot) to marvel at the mammoth waves.